fixed dimensionline length doesn't work any more in the nightlies. Just to not let this slip into the next edition. sorry, i meant fixed extensionline length. Can you describe what you are doing, what happens and what you would expect to happen? Also, I recommend making a GitHub account for reporting issues. When drawing a dimension line for architektural purposes I set the dimension line extension to "fixed", as is the habit there. This possibility was introduced in 2.08 and worked there. In later nightlies and 2.09 it didn't any more. You can set it in the configuration tab but it is not shown in the drawing properly, as if not set. I have added a picture of as it appears in a newer nightly (as is) and in 2.08 (should be). The should be regards the extension line only, zero suppression is better in the newer version. 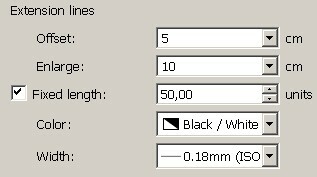 Also added picture of settings tab and example dxf. OK, I will use a GitHub account for issues next time. And for suggestions "suggestions and feedback" in the forum, right? "And for suggestions "suggestions and feedback" in the forum, right?" You may post feature requests and modification requests as github issues also. It works! Thank God (ravas) this has been fixed. So you can do dimensions too. Good to know.